At Ryno Lawn Care, LLC, we provide full service lawn care to increase the elegance of your lawn with complete weekly lawn care. 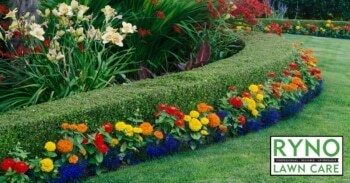 We also provide lawn fertilization and trim the trees and bushes around your yard. Costs vary from one setting to another and depending upon the services you want. That’s why we provide a free estimate. We will completely and professionally assess your needs and provide you with a reasonable and competitive price. *the first and last month’s payment is required up front. Cancellation of the program before the year forfeits the last month’s payment. A card is required on file for payment at the end of each month. There usually needs to be an initial spring cleanup before getting started on the full service program if interested. Ryno Lawn Care, LLC knows that there’s more to full service lawn care than just mowing and watering. If you have wondered why your lawn never seems to thrive or have been longing for more interesting and exciting landscaping options, our professional services will help you have the beautiful, healthy lawn you want. We provide year-round full service lawn care to keep your yard lush and green throughout the growing season and to prepare it well for the winter months. Begin your full service lawn care now to enjoy a lovely lawn through this summer and late into the fall. You will be delighted with the healthy thriving lawn that greets you when winter is over and warm spring weather returns. You can start the growing season with a fresh new look for your yard with trees and shrubs trimmed, grass freshly aerated and mowed and a fresh layer of water-saving mulch to protect your floral plantings, trees and shrubs. Mulching helps conserve water and keeps your plantings properly nourished. Trimming, weed-eating and edging complete the picture for full service lawn care leaving your lawn tidy, healthy and ready to face the long, hot summer months successfully. Regular service from Ryno Lawn Care, LLC will keep your lawn healthy, beautiful and strong throughout the year.